There is some original repertory for organ and piano – think Flor Peeters and Marcel Dupré – for harmonium and piano – think Karg-Elert and Franck – as well as original organ duets – think Wesley and Leighton - but none of that is on this disc. Instead the Nikitine Sisters have done their own transcriptions of Liszt’s largest two-piano work, Mussorgsky’s most famous instrumental piece and a Tchaikovsky orchestral classic. Despite a recording which has clearly been tweaked sufficiently to negate the usual balance issues, it has done nothing to resolve the fundamental problem of combining organ with piano. And that is the issue of tuning. There is doubtless some complex issue of physics which results in the two instruments never sounding comfortably in tune with each other across the range, and to enjoy this disc you will need to suspend any ideas you may have about intonation and pitch conformity. 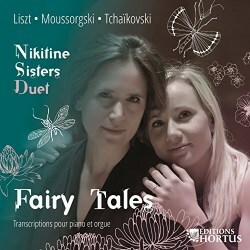 The Nikitine Sisters (whose name, we are told in the booklet notes, is a tongue-in-cheek reference to the Marx Brothers) are French sisters who both studied organ and piano, Véra in Paris with Jean Guillou, Eric Lebrun and Marie-Louise Langlais, and Katherine in Paris and Lyon with Brigitte Bouthinon-Dumas, François-René Duchable and Denis Pascal. The have been doing their organ and piano double act since 2009, and this appears to be their debut recording. One thing which is obvious throughout is their shared sense of involvement in the music and their excellent coordination. The choice of instruments is interesting, and certainly will entice some to this new release. The organ is a Cavaillé-Coll with 6500 pipes and 82 stops (although the booklet does not go into detail as to what those stops actually are) originally built for the 1878 Exposition in Paris and installed in the Trocadéro. It was subsequently moved to the Chaillot Palace and, since 1977, has been in the Auditorium de Lyon where, in 2013, it was overhauled and restored by the Aubertin Company. The piano was designed and built by Stephen Paulello and, in addition to boasting 102 keys, has parallel nickel-wound strings. Neither instrument, I regret to say, is served particularly well by this recording which, if anything, rather stifles the sound of the piano and puts the organ in some kind of dead sound chamber. However, there is no doubt that the extra and rather more clangourous depth of the piano and the unusually broad tonal palette of the organ contribute significantly to the impressive effect of the Pictures of an Exhibition – you only need listen to “Bydlo” or “Ballet of Chicks in their Shells” to realise that this is no ordinary piano or conventional church organ. Liszt’s Concerto pathétique evolved over the course of some 35 years during which he revised and rewrote it, transforming it from a solo piano piece to one for two pianos. If he ever thought about turning it into one for organ and piano, he obviously thought better of it. And for very good reasons. For while this performance certainly makes clear the difference between the two original keyboard parts, both parts are too distinctly pianistic to sound quite right outside their original context. As a result while Katherine Nikitine exudes charm, grace and virtuosity, her sister seems to lumber in on the act with almost elephantine weight and solidity. Even the more gentle and delicate organ passages have none of the delicacy of the piano, and there is that continual, niggling annoyance of the tuning issue, which really does not go away, even when the music reaches its most absorbing. Pictures at an Exhibition is one of those works which seems to survive infinitely flexible arrangements, and while this is the first time I can recall hearing it arranged for organ and piano, it seems more naturally at ease in this new garb than did the Liszt. The organ sets us off each time with the “Promenade” before making way for the piano, and the two indulge in some pleasing conversational gambits (which would work better if the two instruments were singing from the same pitch hymn-sheet). The transcription is by Véra Nikitine and, I have to say works extremely well, with the piano generally offering up the musical substance while the organ adds colour and effect. This is particularly effective in both “The Old Castle” and “Bydlo” where the piano’s percussive bass gives a real sense of shape to the music while the organ looms in the background with atmospheric grandeur in the first, and lumbers along with bovine swagger in the latter. “Tuileries” is also particularly effective in this arrangement with the organ’s high mutations adding a delightfully playful touch, and certainly the unusually thin and stringy reeds give a suitably whining quality to “Samuel Goldenberg and Schmuyle”. For the Tchaikovsky Suite, the sisters share the organ console. The sound is often big and brash and the quieter passages full of sparkling effects. But one can never escape the atmosphere of fairground which permeates this – the organ effects are more sonic than musical – and it seems a million miles away from the subtle delicacies of Tchaikovsky’s original.